Mark and Deb Berman’s marriage has hit a rough patch: she believes he’s having an affair with their next door neighbour, Karen. That may not be the case, but it doesn’t stop Mark constructing a rich fantasy life for Karen and himself, and the fact that everyone else in town believes the same thing as Deb doesn’t make things any easier. But Deb has a secret of her own, one that will prove fatal for her, and will put Karen at the mercy not only of her delusional husband, but of someone much more dangerous. Welcome to Savage Lane, an exclusive address in the rich New York town of Westchester. This is were Mark and Deb Berman live with their children, and where Karen Daily has settled following her recent divorce with her own two kids. From the outset, we can feel the tension as a palpable force, as it quickly becomes obvious that things are far from good between Mark and Deb, and that next-door neighbour Karen is at the centre of their troubles. While the plot sounds like something from Dynasty, Starr blindsides us almost immediately by showing us what’s going on in Mark’s head: there is an obsessive quality to his thoughts about Karen, and their relationship – nothing more, in her eyes, than simple friendship – takes on a much deeper meaning, as he misinterprets their closeness – text messages, pet names – for something much more than it is. It’s an unsettling look into the mind-set of the true obsessive, and leaves the reader feeling more than a little uncomfortable as we find ourselves following him down this dark path. His obvious desire for Karen, and his reactions to the inevitable joking that this will bring from friends and colleagues lead people to believe that something is actually going on between them, and all the talk only serves to prove to Mark that there is more here than friendship. Mark’s wife, Deb, can’t help but hear these rumours, and when she sees Mark holding Karen’s hand, it’s easy for her to make the leap from rumour to fact. What makes Deb so interesting is that, despite attempting to take the moral high ground, she doesn’t have a leg to stand on: Deb is having an affair of her own – a real affair – with a young man who may be more dangerous than her obsessive husband. When she attempts to break the affair off, things take a sudden dark turn, and her boyfriend’s attention, too, is soon focussed on Karen. There is something very over-the-top about almost every aspect of Savage Lane, from the writing style to the myriad affairs and relationships that pepper the story, which at times stretch our credibility to the limit. But what Starr achieves in the midst of all this, is a brilliant examination of the obsessive mind at work. From very early in the novel, the reader is aware of the fact that there is something lacking in Mark Berman’s makeup, something important that should make him “human”; it’s a portrait that leaves us cold and unsettled, that reminds us that evil is most often found in the most mundane of places, a portrait that will make us re-evaluate everyone we know. Savage Lane is not without its problems. For me, the biggest of these is the fact that Starr is not content with giving us one obsessive. While the introduction of Owen Harrison allows him to show the difference between the man who is obsessive in thought only, and the man who has taken the dangerous step across the line into violence and murder, it’s a stretch to believe that they might exist in the same small town, and be involved with the same two women. It’s a fairly major plot point, and asks a little too much of the reader given the story’s otherwise solid grounding in reality. Despite its flaws, Savage Lane is a well-rounded and thought-provoking psychological thriller. 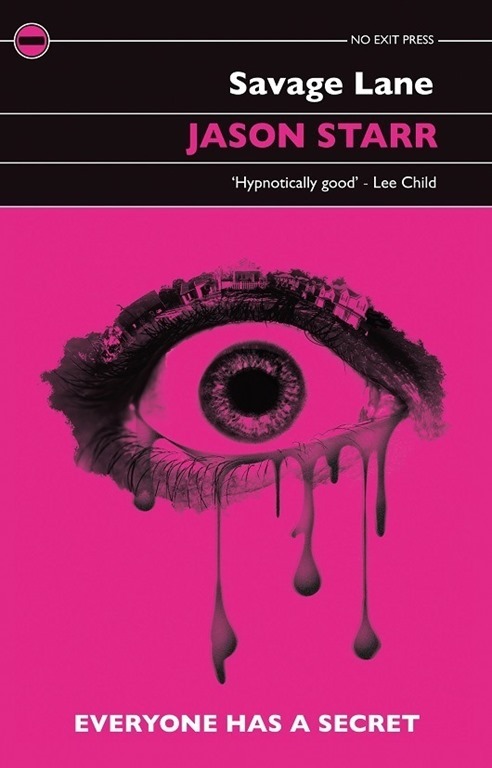 Dark and unsettling, its strengths lie in the author’s ability to imagine the worst and present it as acceptable in the mind of his protagonist. A tale of love, lust and obsession, it draws the reader in and manages to convey, using alternating viewpoints, both the mundaneness of suburban life, and the evils that lurk within the minds of seemingly respectable people. If you’re willing to suspend your disbelief for the duration of the novel, you’ll find it to be an enjoyable and engaging read by an author with a surprising – and not always in the most pleasant sense of the word – insight into the human condition.